As a home cook and a Japanese cuisine advocator, I want to be able to share not just the recipes, but also to uphold the tradition of making food from scratch. I believe there is a beauty in preserving the heritage integral to our food culture. Do you agree? This year I’ve taken up a few cooking projects that I’d like to accomplish, and making miso paste from scratch is one of them. This is my first time making miso, and I can’t be any more excited to share the experience with you! Miso (味噌) is a Japanese seasoning produced by fermenting soybeans with salt and koji. 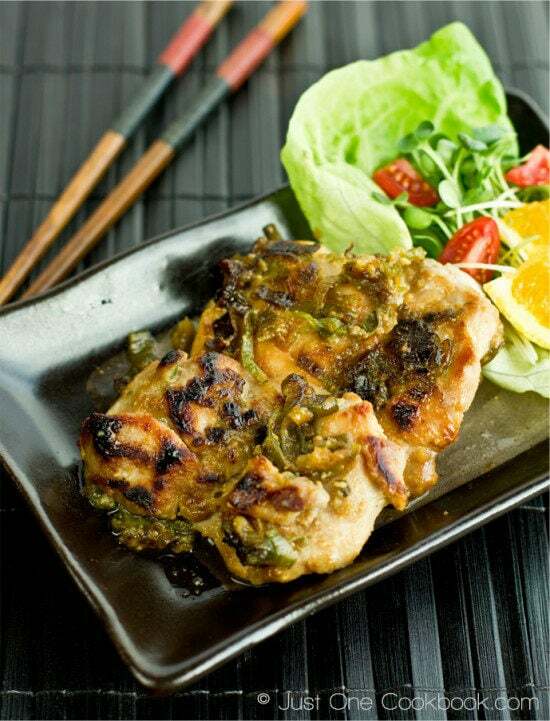 It has been used in Japanese cuisine since 1200 AD (a precursor of miso arrived in Japan from China around 600 AD). If you want to learn a bit more about miso and its different types of miso, please read this detailed miso post on my blog. When I get home from a long trip, I often crave for simple homemade miso soup (and onigiri is a plus!). Even though miso is entirely indispensable in my diet and cooking, I realized that I have never made it from scratch before. Like making your own mochi or plum wine, it struck me that there is something special about making your own miso, and I really wanted to do just that! So if you’re with me, wishing to make this Japanese ingredient from scratch, I hope you’d join me! This miso recipe is not my own and it’s based on this Japanese miso company’s tutorial which I found upon my research. Please understand that this recipe is work in progress and not finalized yet. I may modify the recipe as I continue to improve, but you can expect my update from time to time (even if I fail!). The process of making miso takes 2 days, but it is not until 6 months later only you get to use the product. Umm… are you still here? It may sound daunting, but the method is actually quite simple and I’m sure the result is totally worth the effort! I purchased organic American soybeans from WholeFoods where you can get the exact amount of soybeans you need from a dispenser. Rice koji is steamed rice that has been treated with a fermentation culture, Aspergillus oryzae, koji-kin (麹菌). In the US, you can find Cold Mountain brand of rice koji for sale. 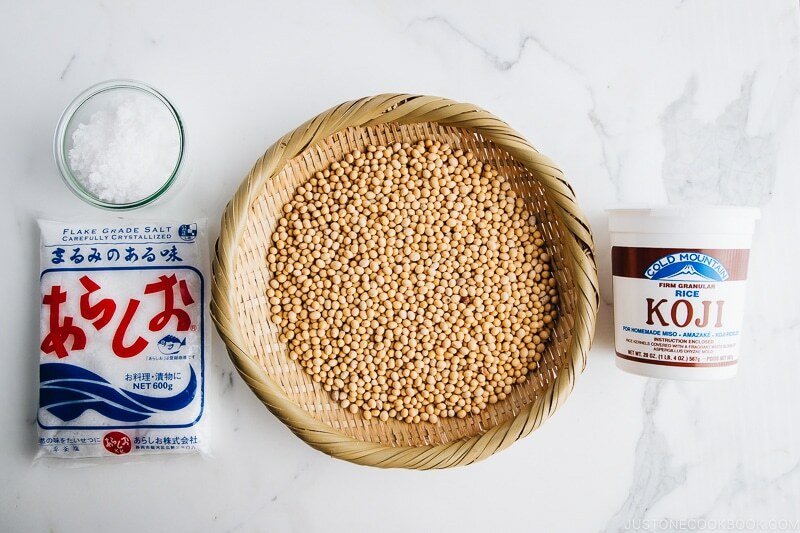 You can also buy rice koji from Anything from Japan which ships internationally. 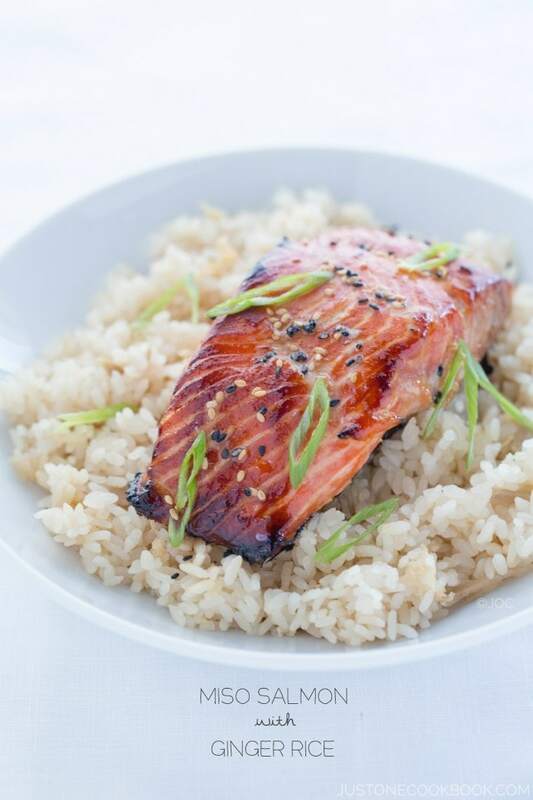 Quality of water plays an important role in making good miso paste, so be sure to use filtered water that is safe and has removed most of the impurities. I recommend getting a kitchen scale (I’ve been using this kitchen scale which cost me $15 on Amazon years ago) and measure correctly when you make miso. I usually use the gram measurement for my baking and other traditional Japanese recipes like Tsukemono. You can use any container but I highly recommend the glass one so you can see the miso making progress from the side. I bought a 1-Gallon Biscotti Jar (large) from William Sonoma but you can get an Anchor Hocking Glass Storage Jar from Amazon. Other choices include a stoneware crock or a large plastic bucket. Use any heavy object that would fit in your 1-gallon container. A plastic bag of table salt works well. The weight should be 1/3 of the miso weight. In this recipe, the miso weighs 3 kg (6.6 lb) so it should be 1 kg (2.2 lb) salt. 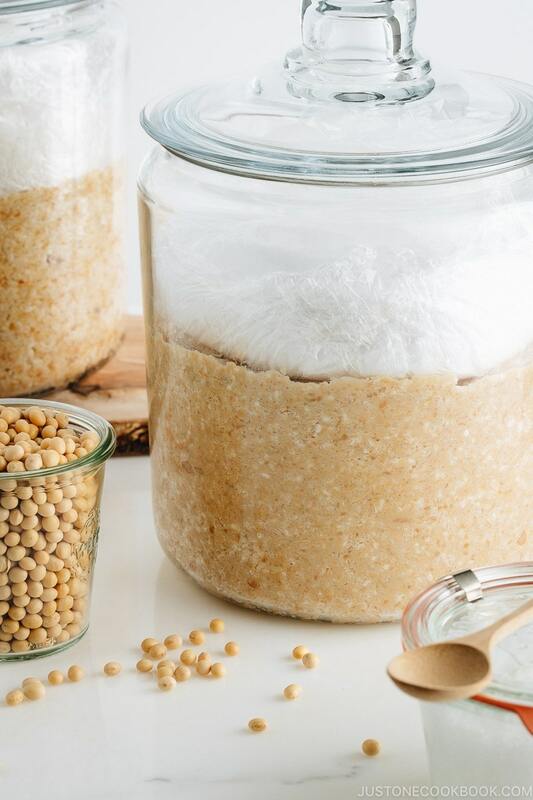 You will need a large mixing bowl (or a large serving bowl) to combine mashed soybeans and the mixture of koji and salt. Tightly covered miso with plastic wrap will prevent mold growth. We use alcohol to disinfect the container, which will prevent mold growth. Dried soybeans take time to absorb moisture (See above photo: 18-hour soaked bean on left vs dried bean on right). To make sure the soybeans are cooked through to the core, you need to soak the soybeans for 18 hours. If you want to start cooking (pressure cook/simmer) soybeans from 10 am, you need to start soaking the soybeans at 4 pm on the previous day. Pressure cook or simmer soybeans until they are soft enough to easily crush between your thumb and pinky. Mash small amount of hot soybeans at a time to make sure they are pounded to an even consistency. It’s okay to have a small number of chunky soybeans here and there, but you should try your best to mash most of them nicely. Alternatively, you can use your food processor if you have one, which will definitely speed up the process. Mashed soybeans must be warm or at room temperature when you combine with koji and salt mixture. 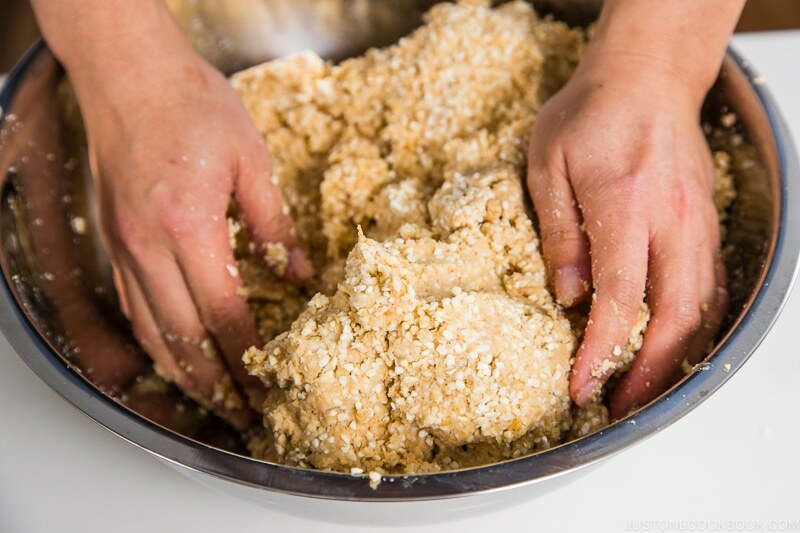 Knead well to distribute the koji to facilitate good fermentation throughout. 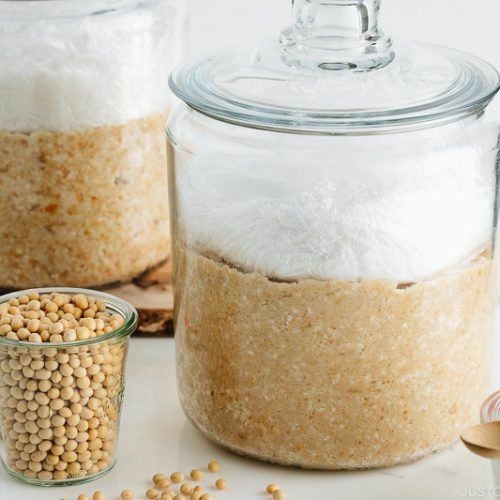 Pack the soybeans in a jar by pressing down each ball of the mixture as firmly as possible to remove any air pockets. This will prevent unwanted mold growth. 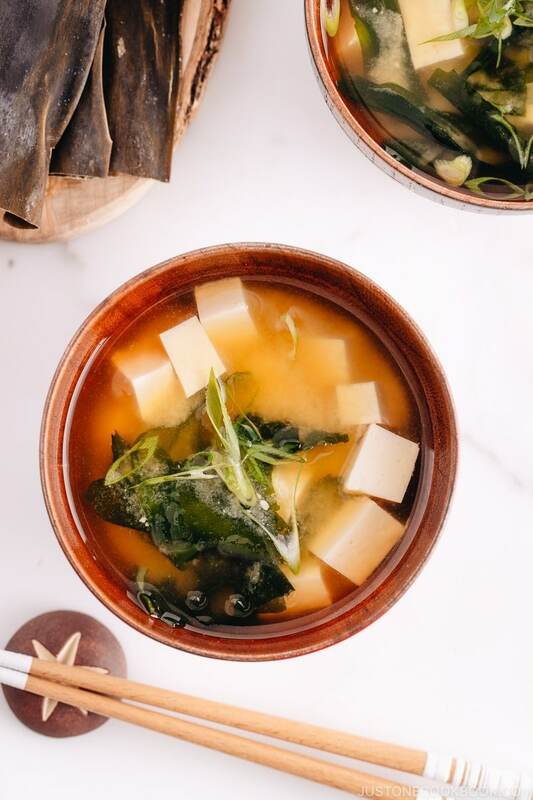 Miso can be made year-round, but it’s commonly made in late fall to winter as miso fermentation works great from a cold winter, to a cool spring, and a hot summer. The timing/season matters for the speed of fermentation and maturation. For example, miso prepared in summer will be ready in 3-4 months. On the other hand, if it’s prepared in winter, it takes more time to ferment and mature, roughly 6 months. Keep checking the progress and taste your miso. 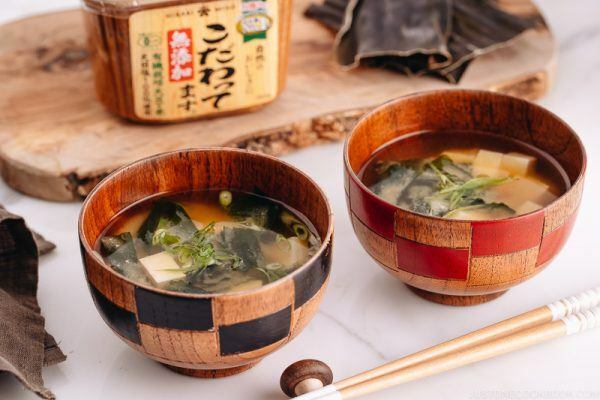 If the miso reaches the flavor profile you like, store in the refrigerator as it slows down the speed of maturation, discoloration, and flavor changes. I’m excited to see how my miso turns out! Make Homemade Miso from scratch with just 3 ingredients and a little patience. My simple step-by-step instructions on How to Make Miso will guide you through this process. Once it is made, you can use the amazing fermented paste for many delicious Japanese dishes! Gather all the ingredients. 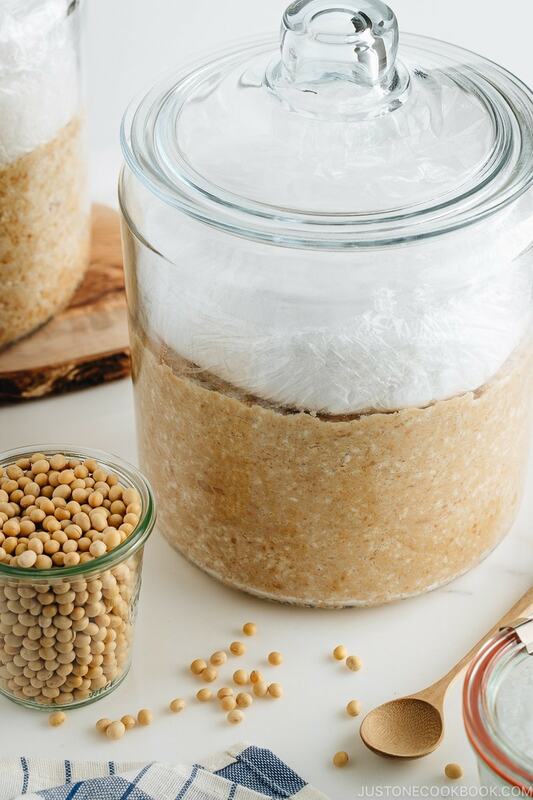 Besides this, you will need 2 large bowls (one should be a very big one), 1 strainer, Instant Pot (or pressure cooker or a large pot), a clean cloth, alcohol (shochu or vodka), a potato masher (or a food processor), a 1-gallon glass jar to put miso in, and a bag of 1 kg (2.2 lb) table salt. 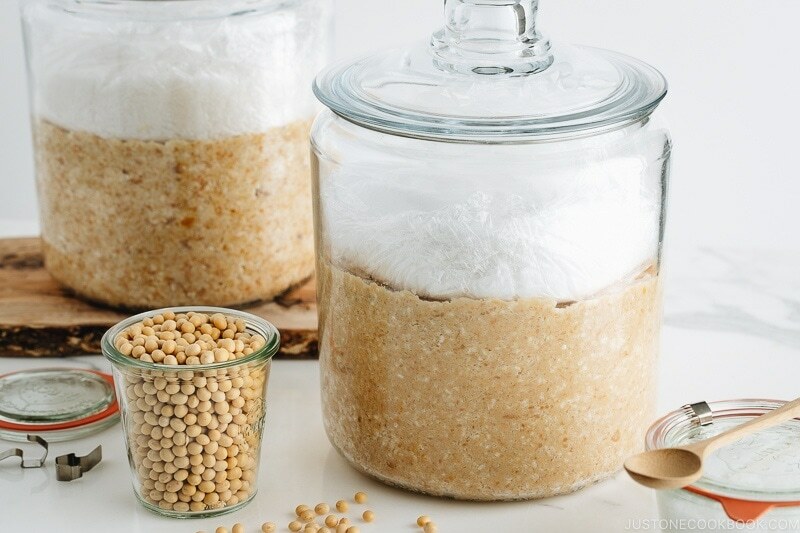 Gently wash the soybeans thoroughly several times under running water. P.S. The foam seen in the images here is not soap. In a large bowl, add the rinsed soybeans and fill the bowl with filtered water to about 5 inches (10 cm) above the beans. Soak the soybeans for 18 hours. Drain the beans. Look how large the beans are now. The right soybean is before soaking, and left two soybeans are after 18 hours of soaking. After soaking, total soybeans weigh 1435 g.
Add the soybeans into the inner pot of Instant Pot. Fill the pot with filtered water to about ½ inch (1.2 cm) above the beans (roughly 8 cups). Close the lid and set HIGH pressure for 20 minutes. Make sure the steam release handle points at “sealing” and not “venting”. STOVETOP OPTION: Alternatively, you can cook the beans on the stovetop. Bring to a boil over high heat, skim off the surface scum, lower to a simmer, and cook for about 3-4 hours, uncovered, until the beans are soft. Add water as needed during simmering to keep the soybeans submerged in just enough water. Meanwhile, in a large bowl (You will add mashed soybeans in this bowl, so use your largest bowl/pot/container/dish), combine the rice koji and salt with your hands. Also, put some alcohol (shochu, vodka, soju, sake, etc) on a clean cloth and wipe inside the jar you will put miso in. Once the pressure cooking is finished, release the pressure naturally. It will take about 30 minutes till pressure comes down completely and you can open the lid. 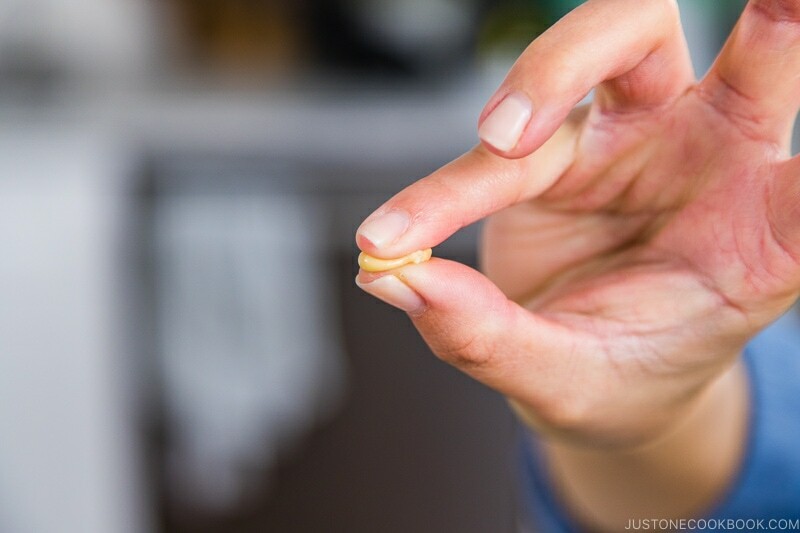 Test if the beans are done, by pressing a bean between a pinky and thumb. If it is mashed nicely, it’s ready. Drain the soybeans over a bowl to capture the cooking liquid. NOTE: When you are mashing the beans, you may need some cooking liquid, so save about 1 cup just in case. Ideally, it’s best not to use the cooking liquid at all (for this particular recipe, which is designed to make miso without adding cooking liquid). Water in the miso has a higher risk of potentially causing mold growth in the miso. 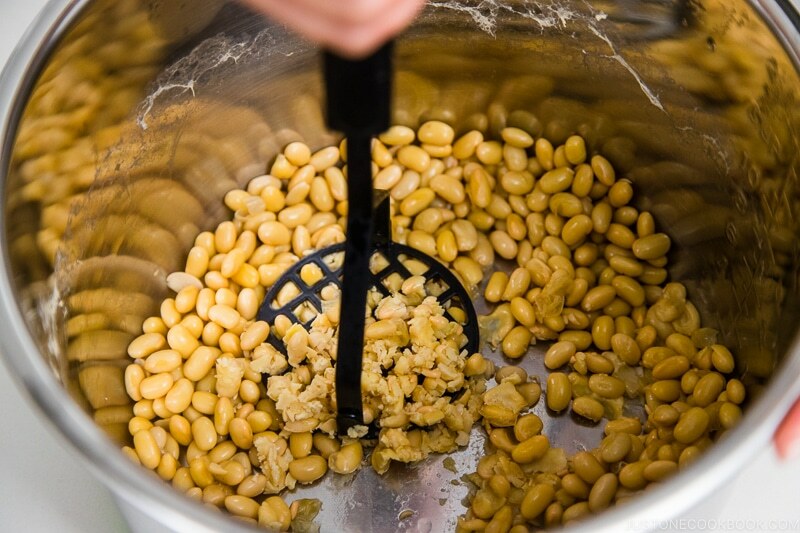 While the soybeans are still hot, transfer some of the soybeans back in the Instant Pot inner pot and mash them with a potato masher (pestle or bottle, etc). Do this process in batches so it’s easier to mash nicely. 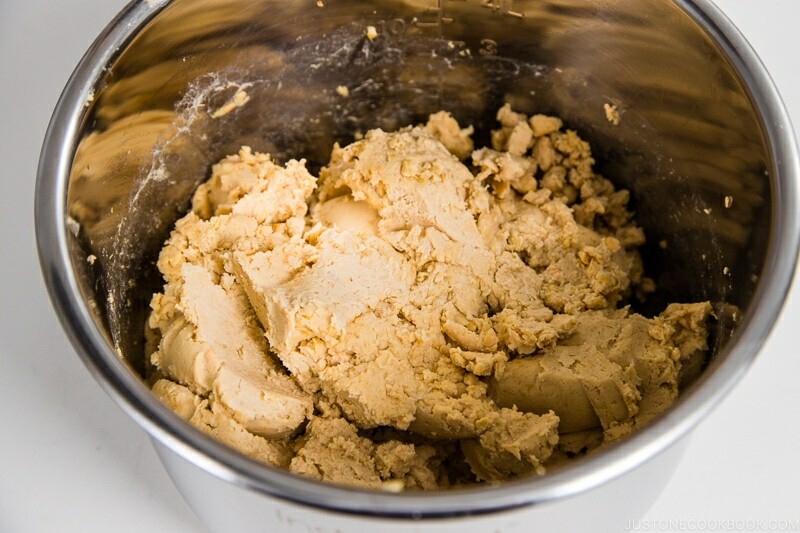 If you have a food processor, process some soybeans until they are paste form. Do this process in batches so it’s easier to process. ONLY if the soybeans look really dry, add a small amount of cooking liquid. As I mentioned earlier, it’s best if you don’t add it in this recipe. Scoop out the paste and continue with next batch. Mashed soybeans must be warm/room temperature (NEVER hot) before combining them with the koji because hot soybeans can kill koji mold. 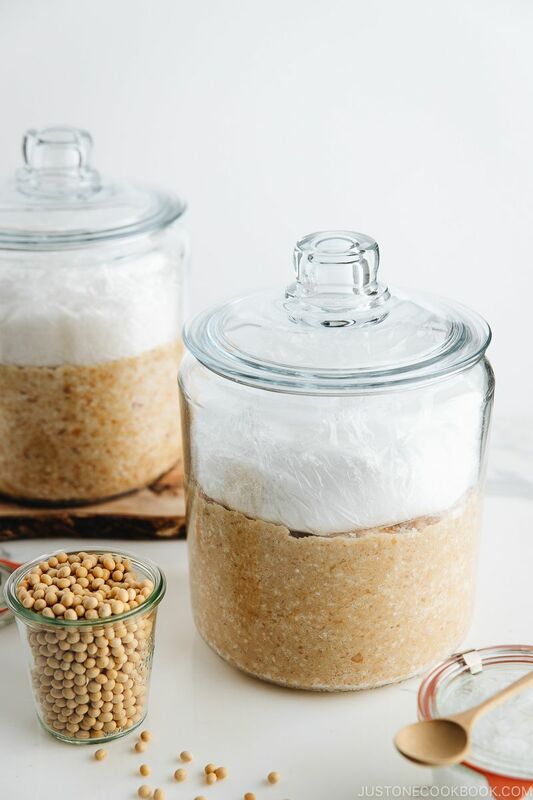 Mashing takes time unless you make a small batch, so you don’t need to worry about the soybeans being hot in this recipe. Add the warm (not hot!) mashed soybeans into the bowl with the koji and salt mixture. Knead well to distribute the rice koji and salt with mashed soybeans. Take time to do this process until it’s mixed well. Using your hands, form tennis ball-sized balls with mashed soybeans. 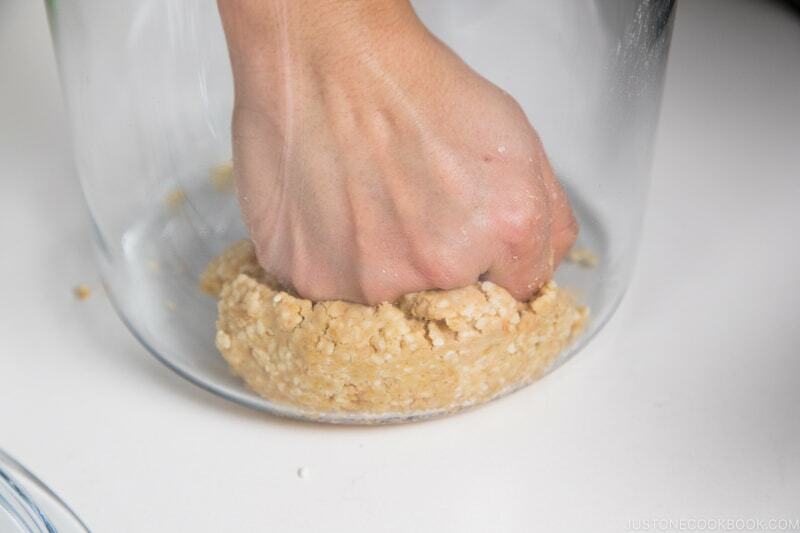 Put each ball into the container and mash it with your fist and knuckle to ensure that all air pockets have been eliminated. Do one layer at a time, and make sure to press down tightly. If you have a glass jar, you can see if you miss any pockets by looking from the side of the jar. Repeat this process until all the balls are pressed tightly in the jar. Pat down the surface with flat of your palm or knuckle to smooth out. Make sure you have a space left for the weight on top of the miso. If your jar/container is too small, use another container. Clean the inside surface walls of the container with a shochu-soaked cloth/paper towel to deter mold. Sprinkle ½ Tbsp of sea salt on top of the surface. Place a plastic wrap on top of the surface and make sure to cover nicely. I use my adjustable drop lid (otoshibuta) to hold down the plastic wrap while I work on covering the edges and remove it when I was done. Put heavy objects (or rocks) on top of the miso. I put 1 kg (2.2 lb) of table salt (cheaper than the sea salt) in a plastic bag and put it on top. Write down the date on a masking tape and put it on a jar. Place the miso in a dark and cool place for at least 3 months (I put in a storage underneath the stairs). You can also use a dark pillow case and try to find a darker spot in the house. Stir the miso from the bottom up once a month to avoid mold forming. When checking the miso, do so quickly to avoid exposure to air. If you see any mold on the surface, carefully scrape it off. 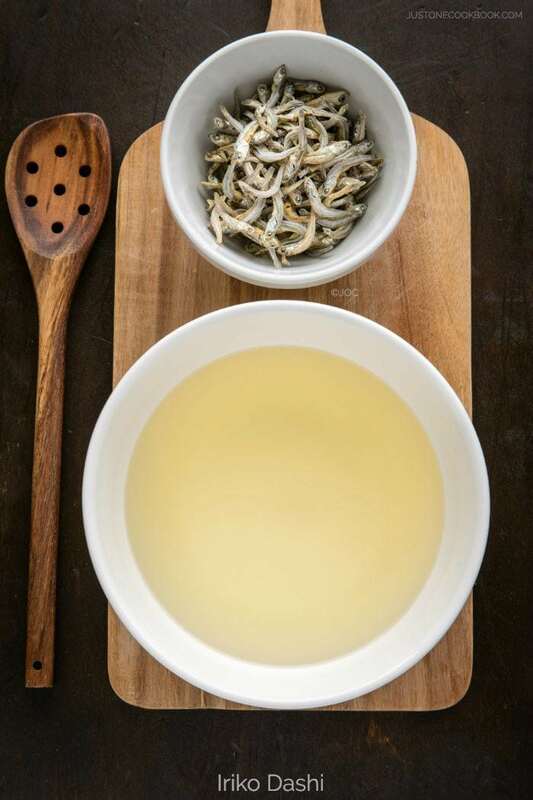 Clean the inside surface walls of the container with a shochu-soaked cloth to deter mold. Smooth the surface, place a new plastic wrap on top, and put the weight back on top. Place the container back to a dark and cool place for another 3 months. During summer months, the fermentation will be faster but the chances of getting mold are higher. Stir the miso from the bottom up every 2-3 weeks and check your jar regularly and remove any mold appearing on the surface. Even if a layer of mold covers the entire surface, the miso below should be fine. Just scrape off the surface to a sufficient depth where only mold free miso can be seen. Clean the inside surface walls of the container with a shochu-soaked cloth to deter mold. Smooth the surface, place a new plastic wrap on top, and put the weight back on top. Place the container back to a dark and cool place for one more month. Remove the weights once the miso is done and store it in the refrigerator to prevent from over-fermenting. You can divide the miso into smaller containers so they will fit in your refrigerator. Now you can enjoy your own miso paste made with patience, love, and perseverance. This miso recipe is based on this Japanese miso company's tutorial. Please understand that this recipe is work in progress. I will be updating accordingly. 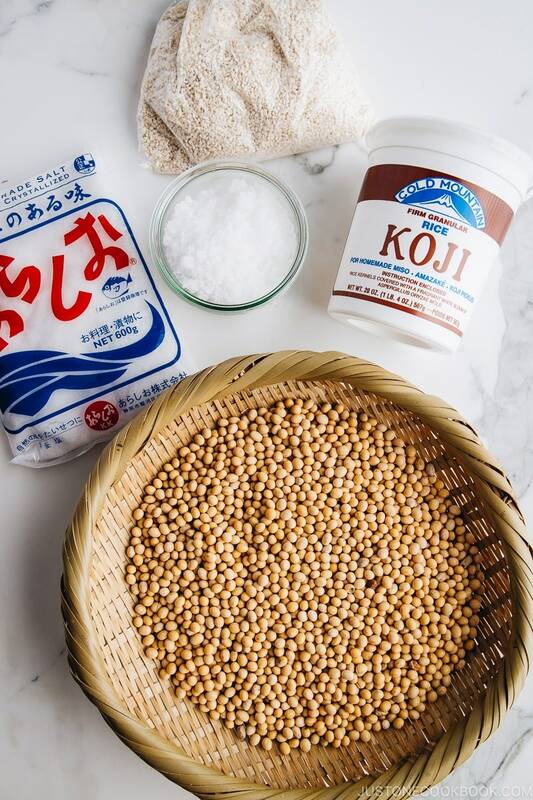 Rice koji: You can buy rice koji from Anything from Japan, Amazon, or Japanese grocery store (you can find Cold Mountain brand and other brands). Soybeans: 1 cup of dry soybeans is 180 g.
I’d also be really interested to see a tutorial of how to make natto using an instant pot! Natto somen might be a good way. Add some shiso, takuan, ume, and mentsuyu…. one of my favorite summer treats! Oh I am SO trying this!!!! I assume I can find koji at any old grocery store over here?? Yes! I usually grocery shop at yorkmart in mutsuura yokohama 🙂 now that you say that it jogs my memory that it is near the refrigerated amazake! I didn’t know what it was before but must be this. Thank you! Will start it in a couple weeks. Keep me posted and good luck making miso! Look forward to sharing our miso making experience! Exciting. I’m looking forward to the next update on the experiment. 1 kg koiji for 650g soybeans? That’s a lot and will most likely prevent me from trying due to lack of availability and horrendous prices. Otherwise Japanese products are a real challenge. Chinese, Korean, Indian, Thai a.s.o ingredients are available, but Japan is not so easy. 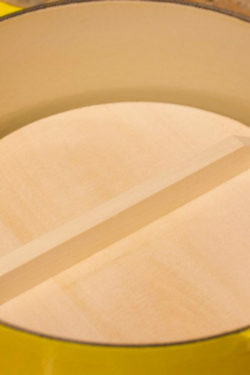 I’ve recently found a nice Japanese online shop anything-from-japan.com with attractive products and worldwide shipping.With the new trade treaty between Japan and the EU it might be attractive to order from them. Previously customs- and import administration fees ruined every budget. Hi Nat! I see, I’m glad it’s getting easier! I have collaborated with Anything from Japan before and I know the shop owner. If you need anything that is not on their shop, let me know. I can ask him. I would like to make the Saikyo sweet smooth miso paste. Thank you as always for your wonderfull blog! Hi Ken! In Kyoto and Kansai area where this miso is produced, it’s just “white miso”. Compared to other regions where “white miso” is made (for example Shinshu area), Saikyo miso is much sweeter. The only difference is that the amount of rice koji is more than other types, and used less salt. I haven’t specifically worked on creating the recipe, so I’m not sure about the ratio. I also read that the saikyo miso’s soybeans are removed after boiling to make the soybeans whiter. 🙂 It’s very fascinating that all types of miso use same simple ingredients but the process and ratio makes different types! Thanks again for your Miso post as it inspired me to go ahead and make the sweet white miso recipe that that was included with the Koji from Miyako Oriental foods. It also has a much shorter fermentation period. Looking for ward to tasting the results in a few months. You weren’t kidding about patience! Six months is a long time. But I’d love to try it out. thanks. I have no problem setting & forgetting things to allow them to ferment, but this seems like a huge quantity for 2 adults. Would this work as well and over the same length of time if halved? I will definitely be trying this. I love doing ferments and wished I paid attention to my obasan when I was younger. Thank you for giving me the courage to try. So if I want red miso, would I just let this sit longer? Hi Keith! Yes, but that’s only part of it. It’s a bit more complicated… for red miso, soybeans are “steamed” while for white miso it’s boiled. Each region makes red and white miso differently. Some regions use soybean koji and no rice included to call it “red miso”… and amount of salt can be different too. 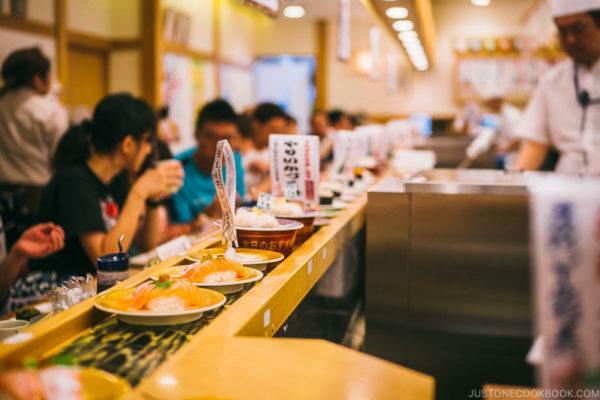 This is why there are SO MANY types of miso in Japan. Each one is categorized differently based on regions, ingredients, how long it’s been fermented, etc. My wife makes miso using garbanzo beans, because soy beans are all GMO. The Garbanzo beans make a really nice miso. I am an retired Chef and I wanted to make something sweet using miso, so I found one that I think is wonderful. It’s a Peanut butter chocolate dipped miso cookie. It’s not my recipe so just google it. I also made miso sugar to sprinkle on top of the cookie. @Steve Cromwell. No, only non-organic soybeans are GMO. Try Laura Soybeans, either at their site or on Amazon. Laura Soybeans has their soybeans tested. 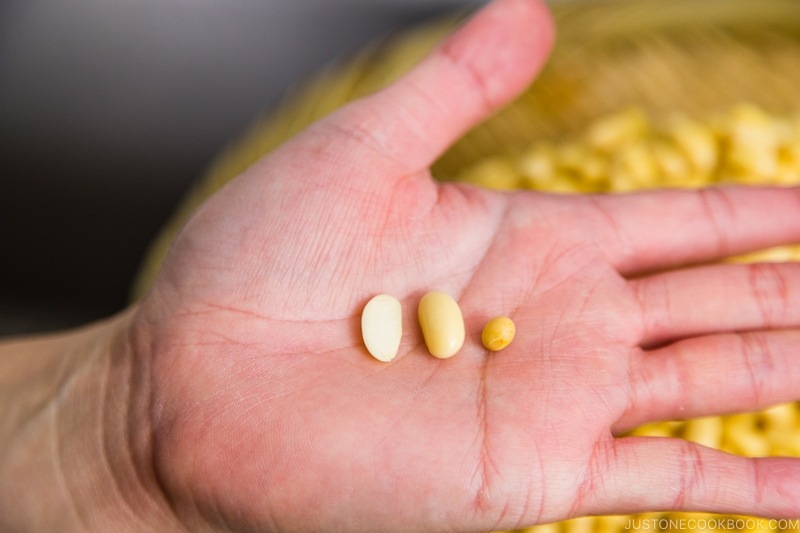 Anything, even a garbanzo can be cross contaminated….and that is the problem. So the only way you can be reasonably certain that something that is labeled as organic is non-gmo is if the grower is willing to have their crops tested. We can trace cross-contamination all the way back to seeds. Rare Seeds also tests their seeds. It is something we have to remain diligent in, but I feel it unwise to make blanket statements that all soybeans are GMO and garbanzos are not. It is not that simple. Thank you so much for sharing the information with us! Hi Steve! I’m not an expert in this… but Whole Foods soybeans are “organic”, and according to USDA regulation, organic foods should not include GMOs. Wow your wife is amazing! I’d love to taste her garbanzo beans miso!!! And I will def google the recipe. 🙂 Thanks for sharing! Off to buy my Koji. I make everything else from scratch, tempeh, seitan, mochi (and not with powder, but the real deal in a mochi machine) and I did look into this many years ago but somehow never got around to it and now you have me inspired again….so thank you. In six months or less, I’ll be back to share the journey. AMAZING! Thanks so much Nami, I’ve been wanting to make miso for a long time, but was so intimidated by the process. Real simple for such a complex tasting ingredient. Just to be patient now. Hi Brad! Yes, the process is easy but I guess there are a lot of micro changes involved to make all kinds of miso available in Japan (considering SO MANY types!). It’s quite fascinating! Good luck with miso making! Always an informative read. Will be waiting to hear how it comes out. Oh, I am SO going to have to try this! I am slightly addicted to miso! I have made pickles (both quick and fermented) so I should be able to get a handle on this. I think I might be able to get koji at the local FoodMaxx (an international grocery store close to where I live). I know I can get the soybeans there. I know there are different types of miso, red, white etc. What is the difference and can someone like me make them? Is it just fermentation times or do they use different ingredients? I would also like to say I love your site! It has been great knowing I can come here to find whatever Japanese recipe I want to try and find a recipe! It has been great for making my lunches when I go to work too! Can’t wait to try this and can’t wait for the next recipe that you post. Hi Victoria! Ingredients are same, but the different amount of salt / soybeans / koji (basically ratio) makes different types of miso as well as the fermentation period. If you are ever in the East Bay, Preserved in Oakland sells fresh Koji made locally. Thay also have miso making classes! Hi Mei! Thank you so much for sharing your tip with us! Whoa koji made locally! AWESOME! May I know where to get the koji?